Last week I launched my first challenge, 5 Shawls, 5 Days. Each day of the week participants would receive an email with one surprise shawl shape—a basic overview of the shape and written pattern that served as the backbone of that particular construction. 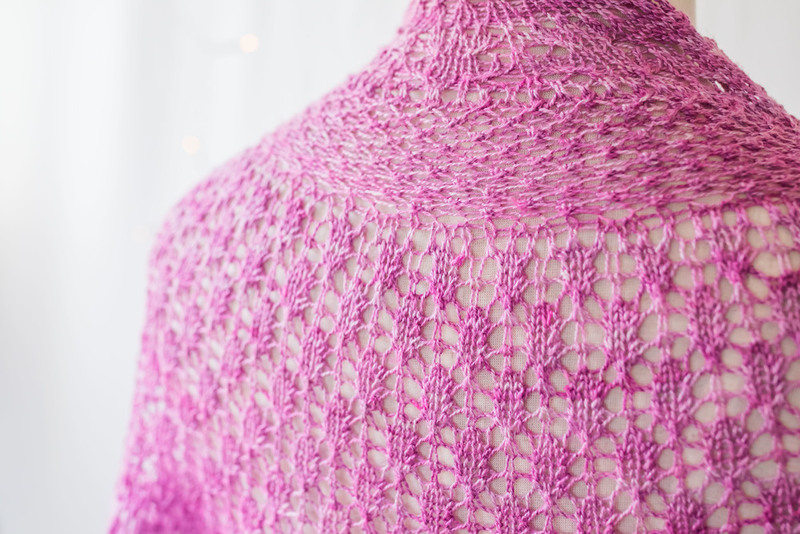 The main goal behind the challenge was to encourage knitters to take the time to see how the increases come together to form a shape, without the pressure of knitting a full sized shawl, with complex stitches. A mini yet educational and motivational KAL with which many had tons of fun! Here below are some of my favorite FOs from the challenge. I was really impressed with all the talent and thought that went into knitting up the samples! Knitters experimented with different types of increases, bind-offs or even added some simple stitch patterns into the mix! Others used some extremely funky yarns to quite stunning effects! Over 600 fiber bosses signed up for the original challenge - more people wanted to play so I created DIY version of the challenge, which saw more than 800 people sign up for that! And today I released my long awaited e-book, "Forming Shawls and Their Charts". This has been a huge passion project of mine and I'm so excited to be finally releasing it! 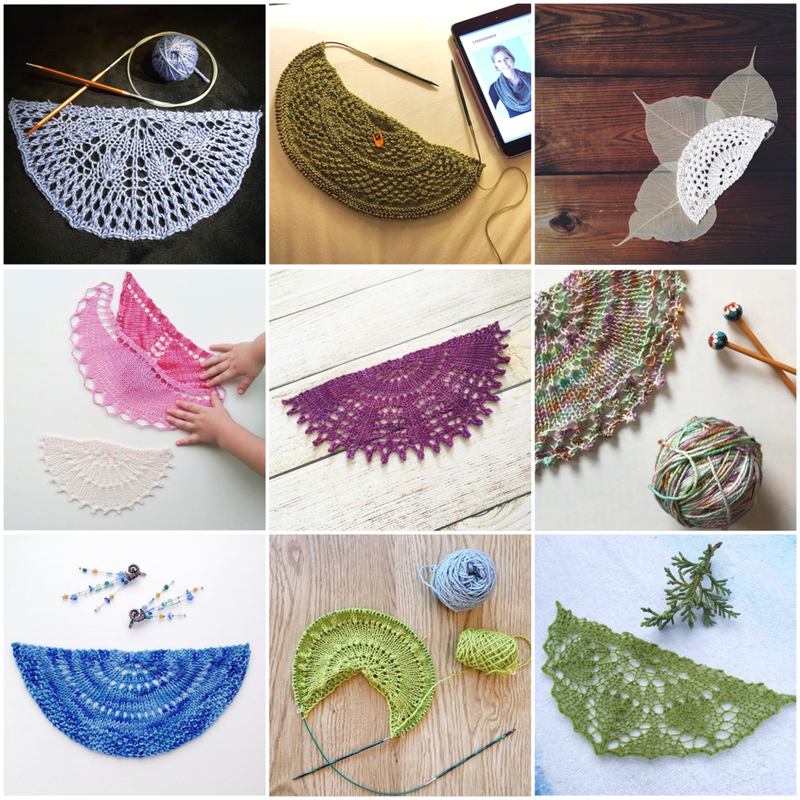 With 15 shawl shapes to discover and explore, you will find the possibilities for shawl knitting and design endless! This week I’m bringing you a special treat—a free pattern! The Chrysanthemum Shawl is one of my latest collaboration pieces. This one is between the talented Amelia Putri, of Papiput Yarns, and me! Amelia Putri has the amazing title of being Indonesia’s FIRST independent yarn dyer. Her mission is to introduce knitting to her community, and introduce the knitting community to Indonesian culture. We have both been huge admirers of each other’s work, so a collaboration was bound to happen. Amelia’s contribution, to this project, is a skein of her wonderfully fabulous Silky Merino lace-weight yarn: 766 yards of soft, silky goodness. Even better, she created a special colorway for this collaboration that we named Ayu Wahine, “Beautiful Woman”, a combination of Japanese and Maori words. The resulting piece is the Chrysanthemum Shawl, an all-over lace piece featuring four different lace patterns coming together to form a painting of elegance, grace and beauty. 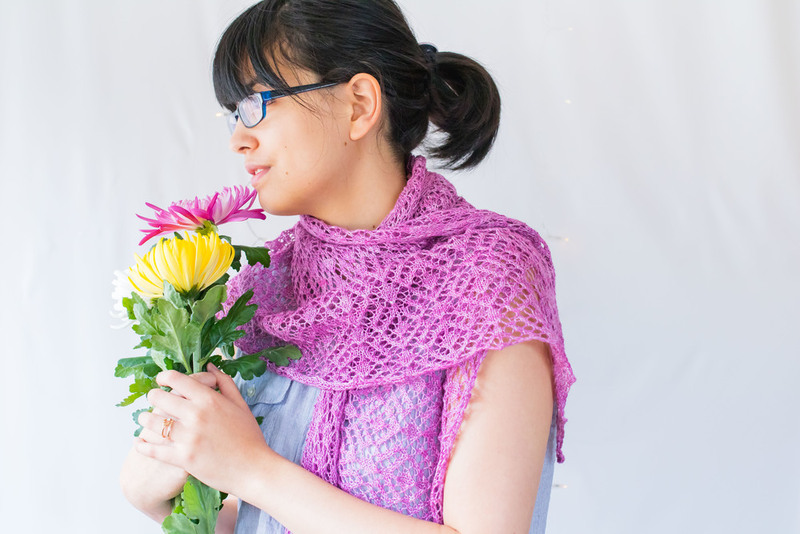 Pair it up with your favorite skeins of lace-weight yarn and you’ll have an eye-catching shawl, which you’ll always want to wear. The Chrysanthemum flower represents optimism and joy, two values that both Amelia and I hold dear! 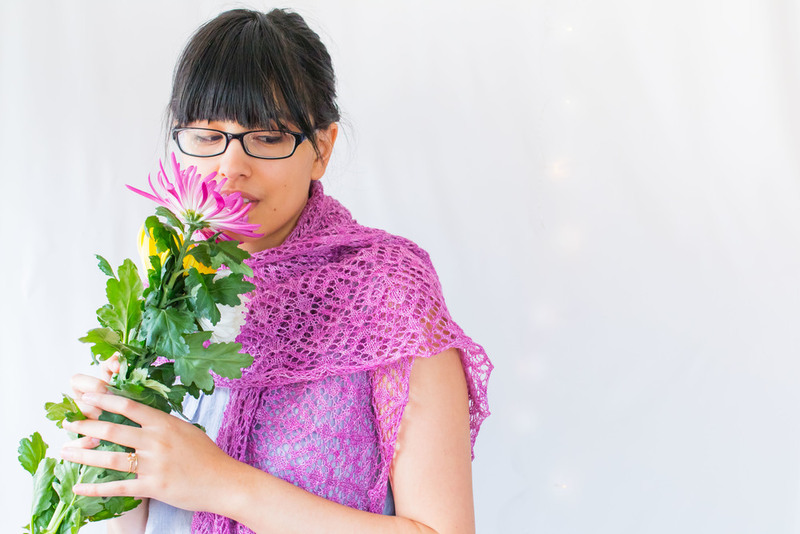 May this shawl bring you joy and positivity, as well as beauty, to your handmade wardrob! A beta pattern means that the pattern has not been tested or edited, but pattern support is still available—email me if you have any questions or problems! The pattern will be available for free on my website until April 15th, by which time it will have been tech edited, corrected, and made available for purchase on Ravelry. And Special giveaway! You can also enter to win a skein of Papiput’s Silky Merino in Ayu Wahine! Just follow the rules below to be entered in! Giveaway ends April 8th. After a long and stressful day, unwind with the Whakataa Shawl. A relaxing and meditative knit, you’ll find yourself entranced by the yarn running through your fingers, hypnotized by the rhythm of the stitch patterns and in love with the swooping silhouette of the crescent shaping. A collaborative piece between Aroha Knits and Moeke yarns, this shawl was designed to take advantage of the rustic and organic nature of the yarn with a classic and simple design and textural stitches that play wonderfully with the variegated bases. The beta version of the Whakata Shawl will be available for free download until January 29th. Make sure to save the pattern to your desktop! Pattern support still applies to betas, so email me if you run into any problems (or post them to the mini-KAL thread in my Ravelry forum)! If you wish to receive the final version, which will be tech edited, corrected for errors, updated with photos and special tutorial videos (including a link to where you can view high-res images), please purchase it when it goes live on Ravelry. Sign up for Frenchie’s Knitsagram to be among the first to know of the official release, as well as receive exclusive discounts on Aroha Knits patterns. You will also receive a free copy of the SeaShell Shawl when you do. Note: if you sign up for the Newsletter but get a blank email, hit respond to let me know. Sometimes the automation system gets a bit buggy. I'm hosting a mini-kal for the shawl in my Ravelry forum, from Friday, January 22nd to February 12th. It's totally laid-back, and stress-free; a good opportunity to meet some of the other magic-makers in the Aroha Knits community and support each other. I'll be present in the thread, available to answer any questions and encourage y'all on. Some small prizes will be given to participants who finish the shawl! Enter below to win two skeins of Moeke Yarns Transylvanian Merino. I reviewed this yarn a couple days ago and all I can say is that it is easily in my top 5 favourite yarns to work with. 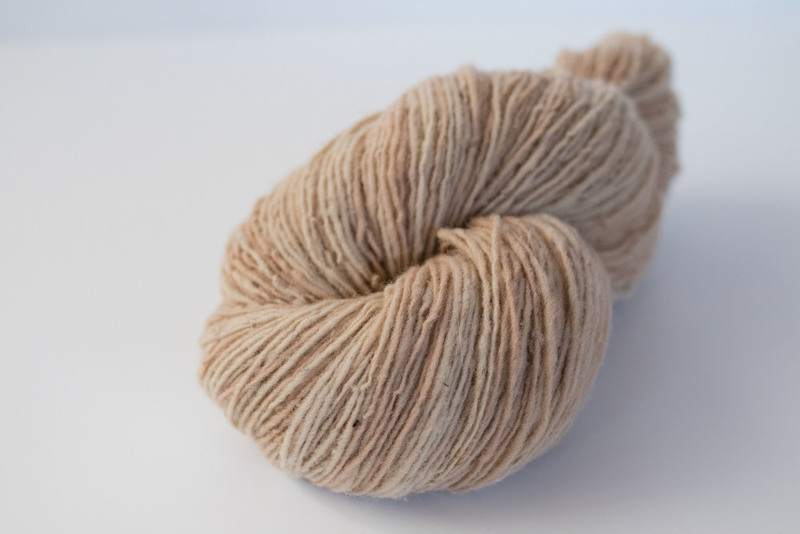 If I can get my hands on some more skeins of this rustic and organic yarn, I certainly will! I'm sharing the goodness of this treasure from Romania with you all so that one lucky knitter will also be entranced by this very special yarn. Just follow the instructions below for chances to win this precious yarn (note: if you are in New Zealand, I will not be able to get the yarn to you. Japan refuses to send yarn to NZ due to customs and quarantines. However, if you are willing to wait until June to get your yarn - which is when I'll be back in the States - then enter away!). When entering, you just need to enter your email address once, even if you do more than one entry. Well, here it is! 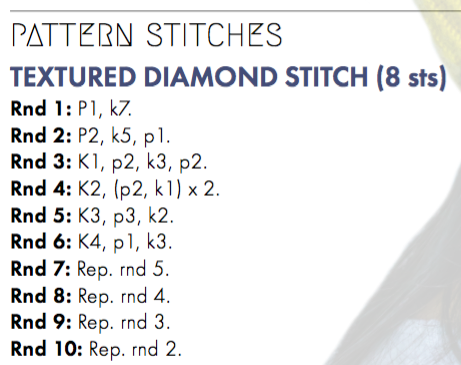 Another pattern in a magazine! At the beginning of 2015, I made it one of my goals to get at least one of my patterns into a knitting publication, and at the beginning of 2016, my managed to surpass that goal by getting three patterns accepted. One in Chicago Knits, Holla Knits! and now Creative Knitting. It wasn't all sunshine and roses, though, I had received way more rejections than acceptances but I'm learning what makes a good submission proposal and what gets me immediately in the rejection pile. But that is not what you are here for! You came here because you heard that I have a free pattern somewhere. And that I do indeed. Introducing the Pata Shawl! Can you see the "water drops" in the leaves? Pata is Maori for "drop of water", based off of the little bobbles in the lace resembling droplets. This is a crescent shawl with the same top-down construction as the Puaka Shawlette - yarn over increases are worked every row to achieve the shape. Blocking it helps stretch it into the proper form but even when the fabric relaxes (as it did in the sample photos here), it still makes for an elegant piece. 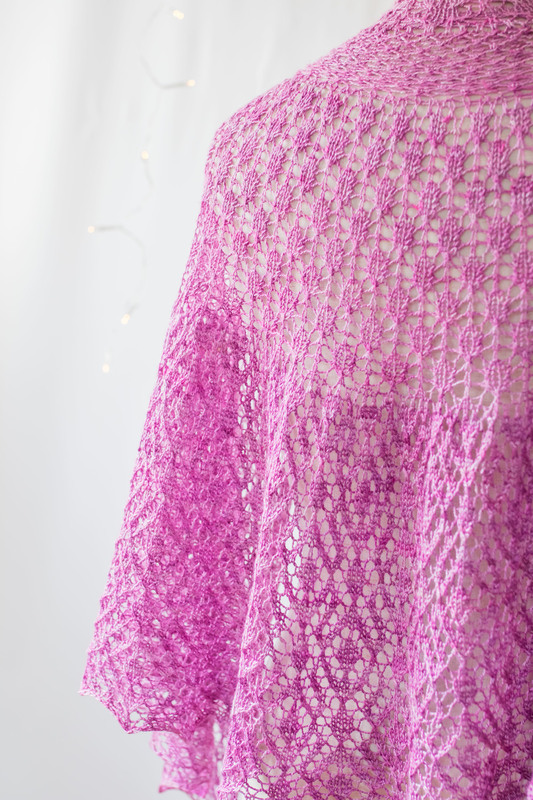 This shawl was chosen as the featured pattern of Creative Knitting's Spring Issue, meaning that it was selected for CK's upcoming KAL, starting this Friday. And as the featured pattern, it is being offered for free for a limited time. So if you download the pattern, consider also joining in on the KAL (pretty please, I'm sure it would make Kara, the editor, happy)! 1. Visit CreativeKnittingMagazine.com and click on the “Featured Pattern” tab. There, you'll find the Pata Shawl, available for as long as the summer 2016 issue is on the newsstand. Click “download,” and it's yours for free! 2. Visit Annie's to purchase Plymouth Baby Alpaca Lace or Plymouth Linaza in the color of your choice. 3. On January 22nd, visit the Creative Knitting Fans Group on Ravelry to get started.